Stunning sites in Dumfries and Galloway are getting ready to welcome visitors to one of the country’s most popular annual outdoor festivals. Blossoming across the country from 30 January to 13 March, The Scottish Snowdrop Festival 2016 features almost 60 properties showing off spectacular swathes of snowdrops carpeting their grounds. The event is taking place at venues ranging from visitor attractions to privately owned estates which are not normally open to the public. It not only gives visitors the opportunity to marvel at the magnificent seasonal displays but also to explore several of Scotland’s most beautiful settings. 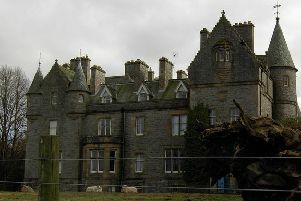 The Dumfries and Galloway properties taking part are Barjarg Tower at Auldgirth, Craig at Langholm, Danevale at Crossmichael, Dunskey Gardens at Portpatrick, Logan Botanic Garden at Port Logan to the south of Stranraer, Cally Woods near Gatehouse of Fleet and Kirroughtree Country House Hotel at Newton Stewart. “Snowdrops are loved by everyone - it’s always wonderfully cheering to see them appearing and that spring can’t be far behind, I hope that as many people as possible will get out and about to enjoy this great seasonal sight around Scotland’s most stunning gardens, woodlands and estates. “Many of the Snowdrop Festival locations are within the grounds of impressively-designed buildings, such as Barjarg Tower at Auldgirth where I understand the original Tower House dates back to the late 16th century but has had various cleverly designed additions over the years. There are 300 varieties of Galanthus, to give the snowdrop its botanical name, and the versatility and hardiness of this classic winter flowering plant means it grows in a great range of locations. The Scottish Snowdrop Festival, which is now in its 10th year, aims to get people of all ages out and about to celebrate this blooming winter wonder which never fails to bring a longed-for assurance that the brighter days of spring are on their way. By encouraging visitors to Scotland’s great gardens, woodlands and estates, the event also provides a welcome business boost for attractions during a traditionally quieter period of the year.